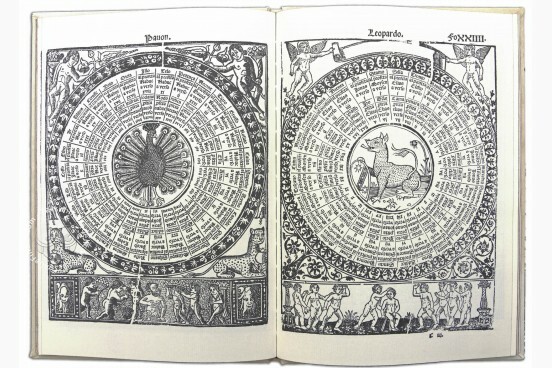 The game is about guessing the answers to a set of main questions about life and the purpose of the game among many other thousand possibilities is to avoid doing nothing. 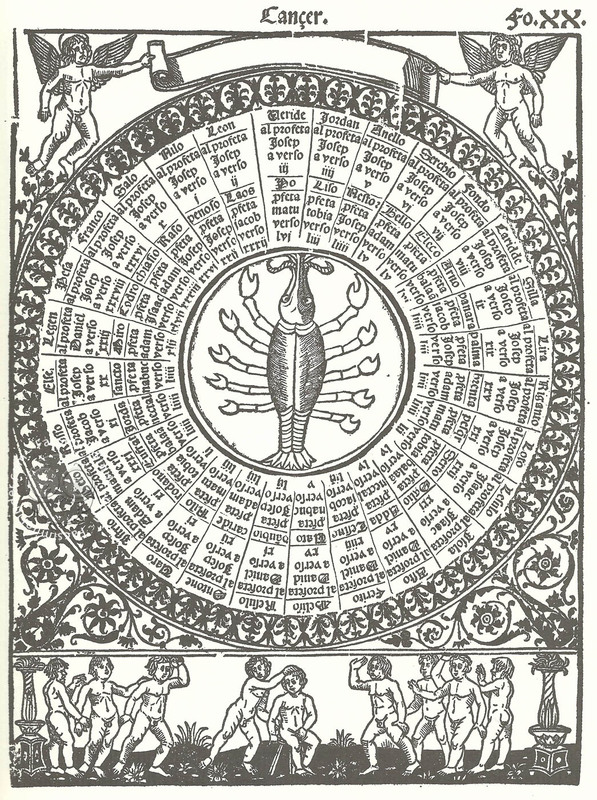 The prologue explains this and takes the reader forward informing that the answers are nonsense. 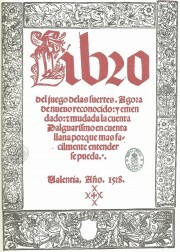 The book went however to the first Spanish index of forbidden books, in 1559. 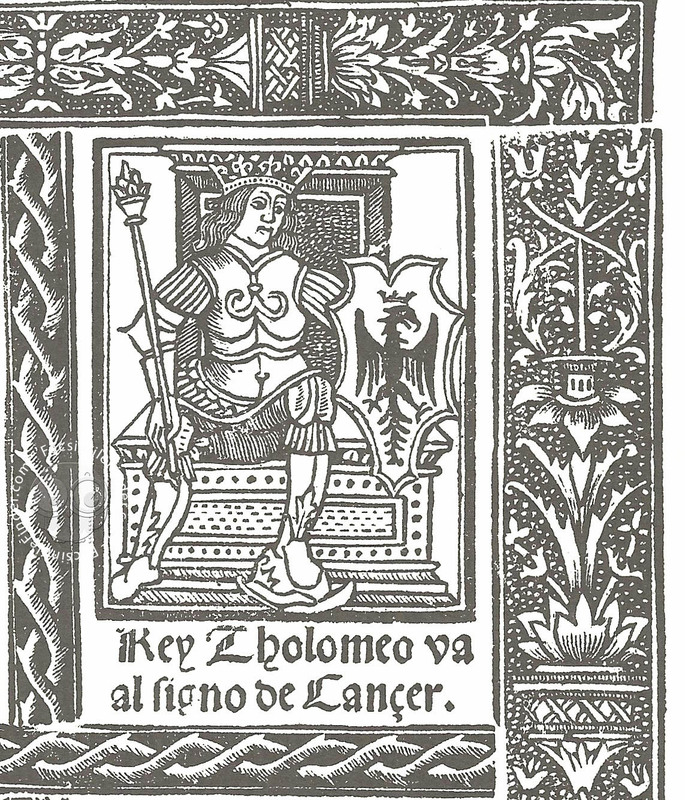 The work is unnamed, but is attributed to the Italian poet Lorenzo Spirito or Gualteri, this was his proper surname. 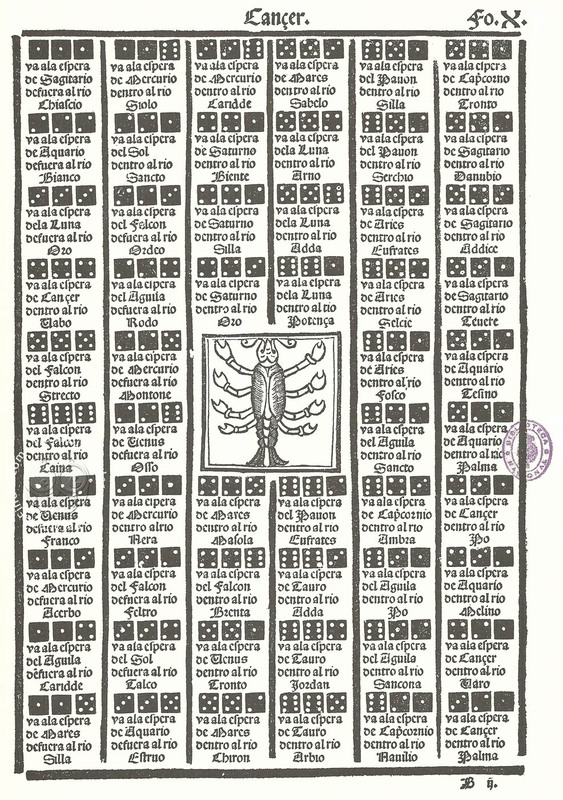 The first known edition of this work with the title Libro della ventura, ovvero Libro delle sorti is from Vicenza, between years 1480-1490, and kept being edited in Italian until the middle of the XVI century. 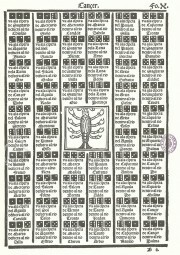 There are several editions in French in the XVI century. 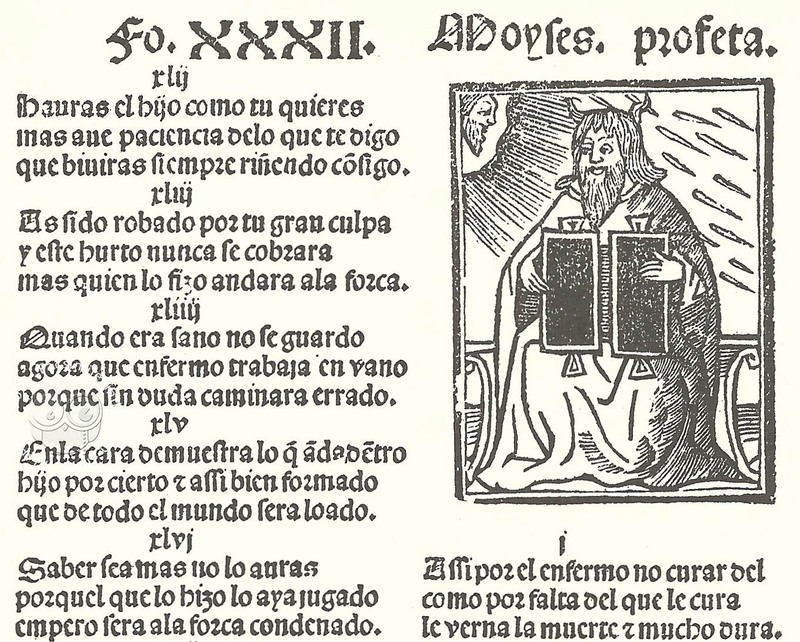 There was one edition in Castilian in 1502, in Milano, there is no copy left of it, however Hernando Colón owned one; it was reedited in Valencia in 1515, in the workshop of Jorge Costilla, and nowadays one copy is known kept with the legacy of Antonio Rodríguez Moñino and María Brey in the Biblioteca de la Real Academia de la Historia; the 1528 edition, included in our Collection, and finally another from 1535 also with just one copy known to be kept in the Austrian National Library, in Wien. 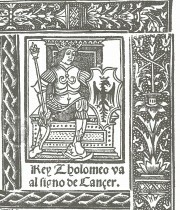 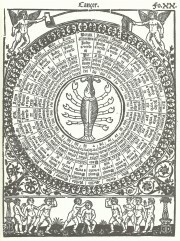 This copy was also among the books exposed in The New York Public Library in the 1985 Exhibition "Tesoros de España: Ten Centurias of Spanish Books". 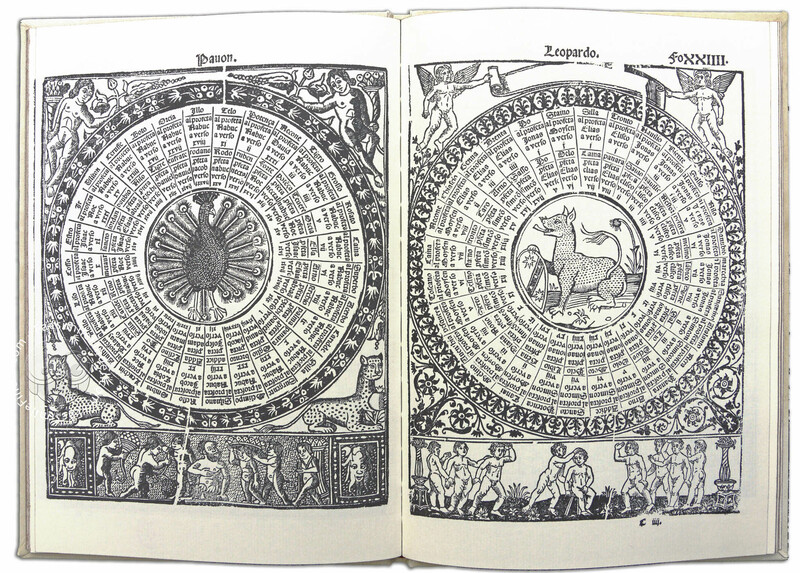 Printed book on paper − 30.3 × 21.5 cm − 80 pp. 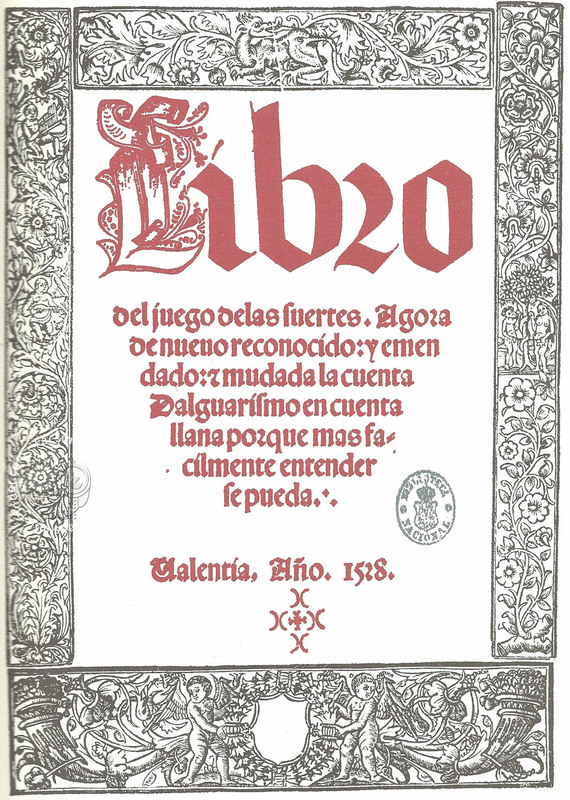 Full-size color reproduction of the entire original document, Libro del Juego de las Suertes: the facsimile attempts to replicate the look-and-feel and physical features of the original document; pages are trimmed according to the original format; the binding might not be consistent with the current document binding.